Two weeks ago I revisited old coaching ground inspired by success of Croatia at World Cup. I spend a third of my hour session playing our version of handball. The next session, first question from participants was to ask if they were to play handball again. They had loved it and couldn’t wait to play again. Handball and futsal are twins as both games are played on same court with same size goals. Whether futsal helps handball I doubt, conversely handball really can help create the futsal player. 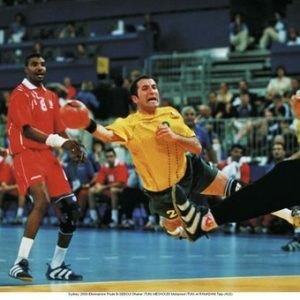 Handball players play with their heads in the air, aware of all around them. Football/futsal players left to their own devices play heads down, only the cream play head up and aware. My experience is my futsal groups playing handball take to the game like ducks to water. It’s easier to catch a ball than kick a ball so moderate success is immediate. Important in young player development, they also learn to move around court and take up free positions to receive the ball; everyone is so much more alert. The last game of the senior league season we had a match with a pro handball player in one goal and GTFC’s Scholarship keeper in the other, their movements and actions mimicked each other. In a game the handball player will make most of his saves diving down, the futsal keeper the opposite. Try it, can’t get a proper ball or don’t want to follow full laws, make up a hybrid basket ball game. This entry was posted in Kevin Bryant news updates on July 30, 2018 by Kevin Bryant.